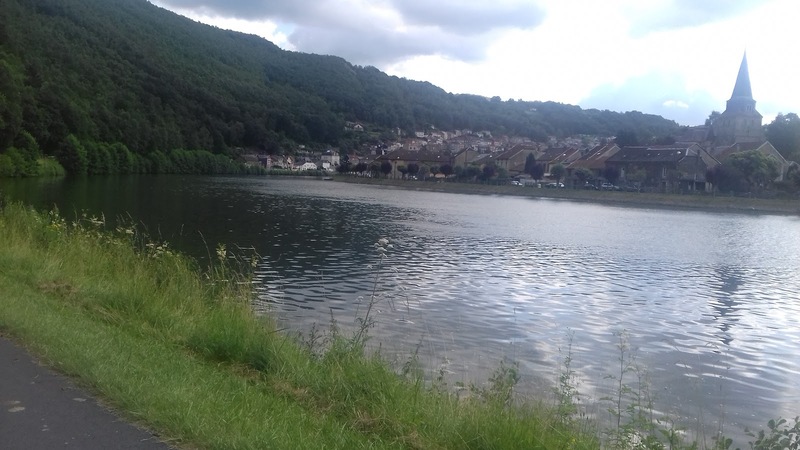 We're parked up on a small Aire right at the side of the River Meuse in the village of Bogny, and for the next couple of days we plan to spend our time cycling, today in one direction, and tomorrow in the opposite one. 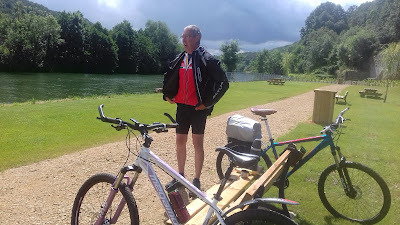 Therefore, once we'd finished breakfast we hoisted our bikes out of the garage and set off towards the town of Revin, however right from the start I had a couple of new odd noises coming from my bike that were a bit unnerving. This resulted in us stopping on several occasions for John to fiddle and twiddle, but despite his best efforts the rubbing sound and an unrhythmic clunking persisted. 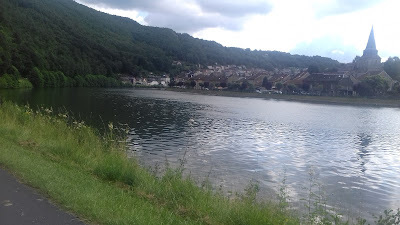 However, despite those little disturbances our ride was quite lovely as we followed the dedicated tarmacked cycle way that runs along side the River Meuse for many miles. As we passed through the villages of Montherme, Deville and Laifour the sun was shining warmly on us, and along our way we frequently passed under both new and old bridges that were festooned with bright summer flowers, and had flags fluttering from them. Then, as we neared our goal of Revin we cycled through a tunnel that was 224 metres long, and showered us with icy cold water that dripped form it's craggy ceiling as causing us both to shiver when a well aimed drip dropped down our necks. 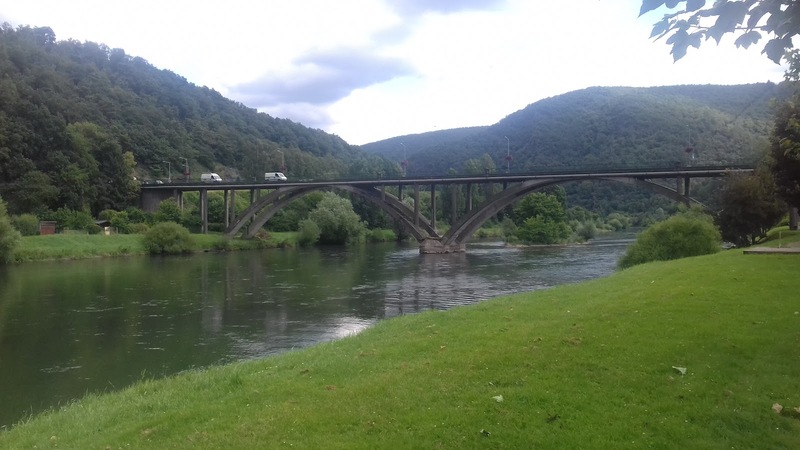 By the time we reached Revin we had covered 27 kilometres, and as we would need to do the same for our return journey back to T4rdis2 we decided not to go any further - 54 kilometres would be enough for one day! When we got home John was fairly determined to fix my bike, (because the noise was getting on his nerves! ), and also his own bike which had been making a clicking noise for quite a while. So, out came his 'if any one can fix it Grandad can' T-shirt, and in no time at all both problems seemed to be cured! Wednesday 13th July 2016. Heavy cloud and rain but occasional sunny periods. This morning it was a 'shall we risk it day'. The rain had pitter pattered on T4rdis2's roof for most of the night, and while we were having breakfast it looked a bit ominous, but our plans had already been made so we decided to stick to them, and additionally, John wanted to check out if his little tweaks had fixed our bike problems. And to start with, all seemed well - as we set off it was fine and warm, but we had only gone a few kilometres when the grey dark clouds begun to gather - and then the heavens opened with a deluge that forced us to quickly don our coats and take shelter under a tree. The huge rain drops were literally bouncing about 6 inches from the ground, and the track soon looked similar to the river it was running next too, but luckily it didn't last long. 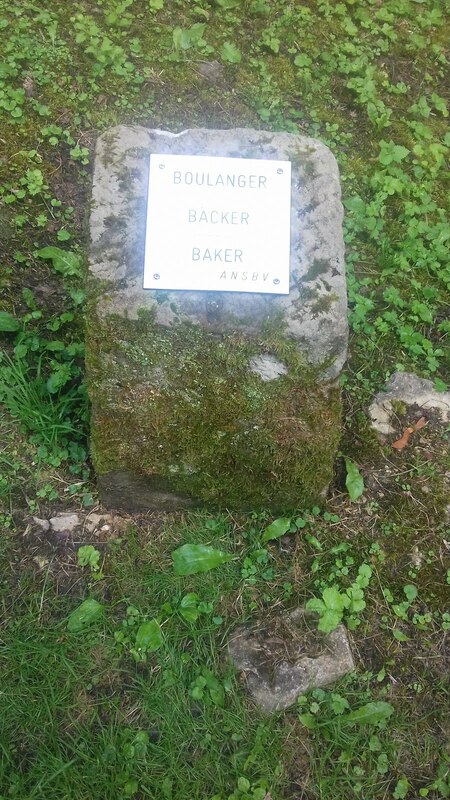 Another 6 kilometres saw us taking our coats off again, and from there for a while it was on, off, on, off, until we reached our lunch spot just after the town of Charleville-Mezieres, when the sun came out so at least we didn't have to endure soggy baguettes! But oh dear, after lunch, the rain set in with a vengeance and we had 25 kilometres to cover for our return journey, in fact at one point, I thought John had taken a wrong turn and led me under a waterfall - it was just like riding into a cold continuous torrent! 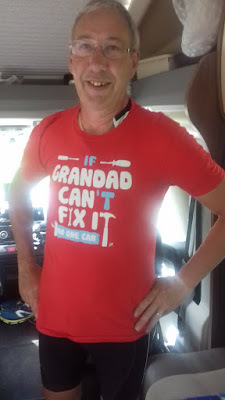 Oh well, it was all good fun and, as always happens we eventually made it home - albeit in a rather soggy state, but nothing a nice warm cup of tea didn't quickly fix! 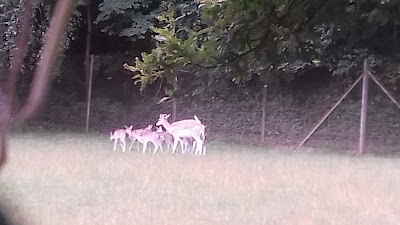 However, we did feel a bit sorry for our neighbours - we'd seen them back down the track sheltering under a bridge without any waterproof gear. We've been back for an hour now and the rain hasn't stopped - I'm sure that eventually they would just have had to get back on and ride in the rain but they had at least 10kms to go so I bet they were soggier than us! Oh and the clunking - still there but not so loud! Well, what a night that was! We hadn't realised that today was Bastille Day - the celebration of the storming of the Bastille Prison in 1789 - and festivities started late last night here in Bogny. We had just settled down in bed at about 11.15, and no sooner had our heads touched our pillows than the fireworks started - and I've never heard such loud bangs - they caused the van to shudder and the actual atmosphere seemed to vibrate at times! The major organised really loud ones went on for about 45 minuets, but less organised pops and fizzles continued till about 1am! So this morning we were a bit reluctant to rise, but as we had planned to continue our journey, rise we did. 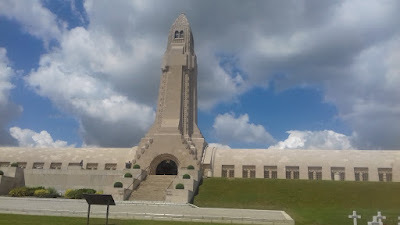 We aimed T4rdis2 for a place called Verdun where more fierce fighting took place in World War 1 and where there are many more memorials and cemeteries. 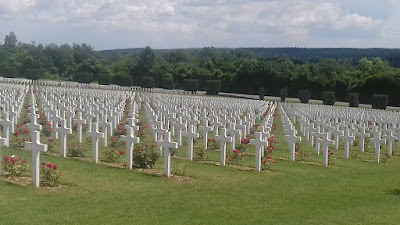 It was somewhere that we hadn't particularly heard of before but our guide book informed us that Verdun will be forever remembered for the horrors of the 1916 Battle of Verdun where about a million men died in a year of continuous bloodshed that was considered to be the worst single battle of the whole war. One cannot imagine the horrific deprivations these poor men must have suffered. From here we moved on to The Musee - Memorial de Fleury, but only to find more horrific information concerning how the civilians in the area suffered. 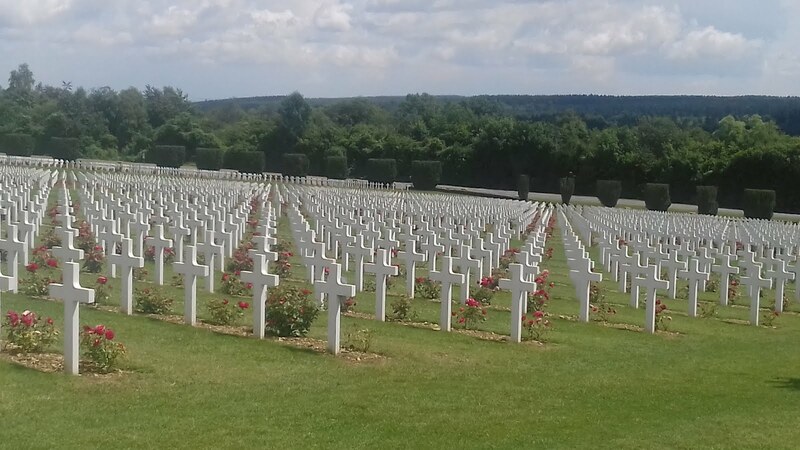 The story of Fleury-devant-Dauaumont - one of 8 villages in the area that was totally destroyed by the battles. On 21st February 1916 the order was given to evacuate the village, so in the snow and ice families, many with small children, crowded into carts, or walked leading their livestock. The village was completely destroyed with only a huddle of smoking ruins to mark it's place. However, in 1972 Fleury's streets were resurrected as a memorial, and a marker was placed at the location of each house or business. 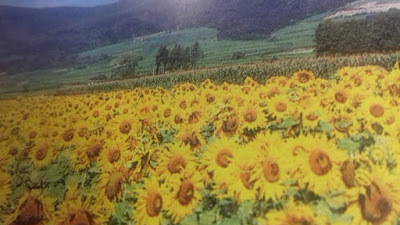 We found the butchers, the wash house, the blacksmith shop, the school and the Town Hall, and to allow visitors to walk amongst them, walkways have been laid out amongst the shell craters and newly planted trees. Our day had been a very sombre and thought provoking one, so when we had finished all our visiting we were very glad to find ourselves tucked away beside the huge peaceful Lac de Madine watching the changing colours of the sky as the sun set behind us. Friday 15th July 2015 - A bit cloudy but with long bright sunny periods. We've had a quite day today - but we're very saddened to hear about the tragic going's on in Nice. 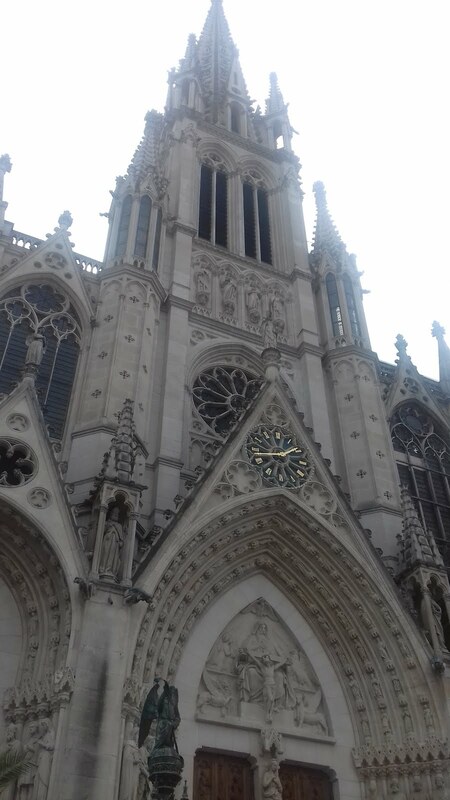 We've now left the Champagne region behind and we're heading deeper into the Alsace and Lorraine region which is in the Northeast corner of France. Our aim for today was to do some more food shopping, to service T4rdis2 and then aim for a little Aire at Richardmenil where we had read valuable electricity would be available (for free) so that we could have a recharging session - computers, vacuum cleaner etc! 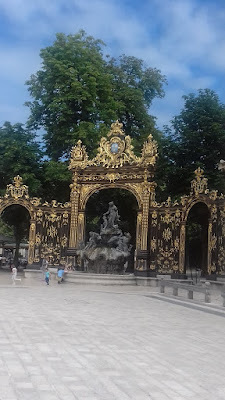 The Aire turned out to be a little gem in a wooded area with the Canal des Vosges and the River Moselle passing close by, and within easy cycling distance of The Lorranine's Capital - Nancy. So, we'll be staying put for a couple of nights and Nancy will be tomorrows target. Saturday 16th July 2015 - Warm and sunny but with some cloud cover. This morning as planned we set off for the UNESCO listed university city of Nancy, and as usual here in France, we could get all the way into the city by using dedicated cycle ways. Nancy was about 20kms away from where T4rdis2 was parked, and for most of the ride we were peddling along a canal tow path admiring the numerous birds and brightly coloured insects and wild flowers as we went. 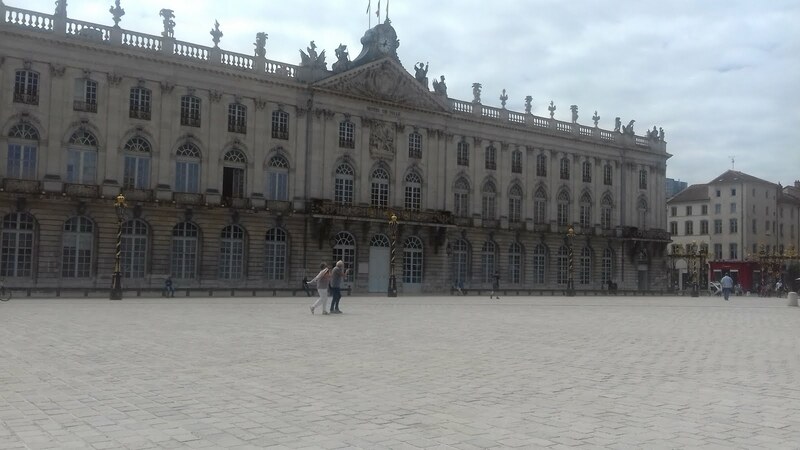 When we first arrived in the outskirts of Nancy I thought we were going to be disappointed with the city because the suburbs were a bit scruffy and littered, but once we reached the centre we were well and truly wowed. We were aiming for the 18th century Place Stanislas which was named after a Polish king, and is laid out in an elegant square enclosed by ornate gilded wrought iron gates and railings which have been beautifully restored. 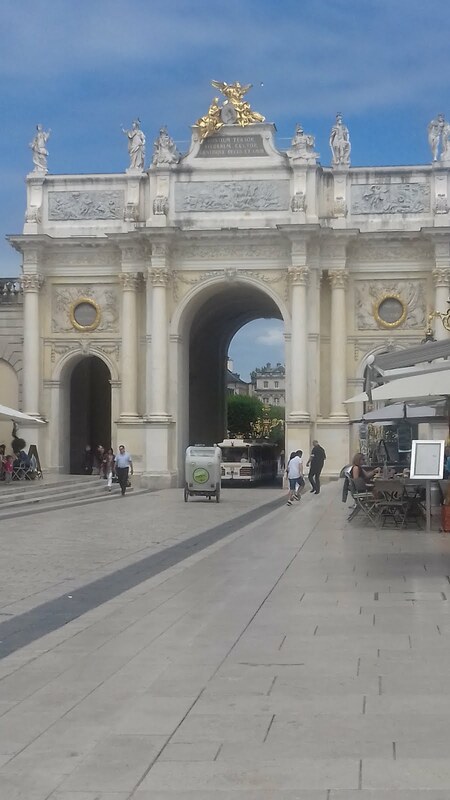 The square is lined with huge hotels, posh eateries, and has ornate fountains in two corners, and there is also a spectacular Arc de Triomphe, that once we had passed through, led us into The manicured tree lined Place de la Carriere with it's Gothic Palais du Gouvernement at the end. From there we admired Nancy's Basilique St Epvre before nipping into the Parc de la Pepiniere to partake of our picnic lunch - we didn't think that in our bike gear we were quite dressed for the posh nosh restaurants - and really I think we picked the better place anyway. 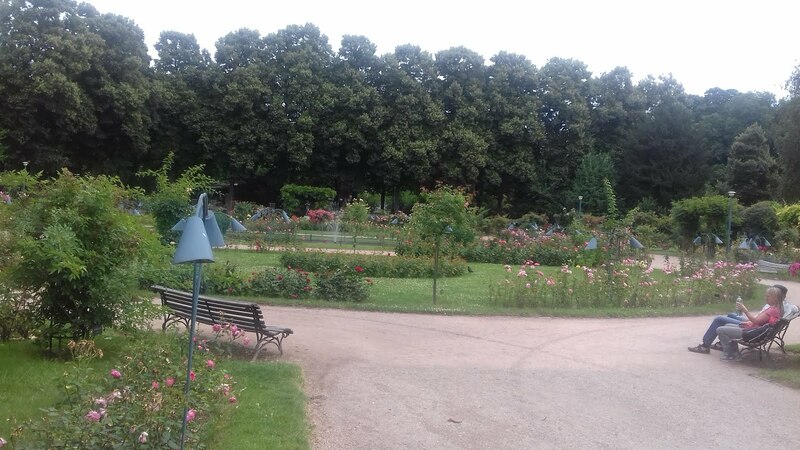 The park was festooned with flowers and there was a beautiful roseraie from which drifted a lovely aroma that seemed to envelope the whole area. Following lunch we retraced our tracks back along the canal, and now that John has had another go at curing my bikes clanking, we're going to sit in the lovely evening sunshine and sip a drop of Pinot Gris, so I'll sign off quickly for now before it gets warm.